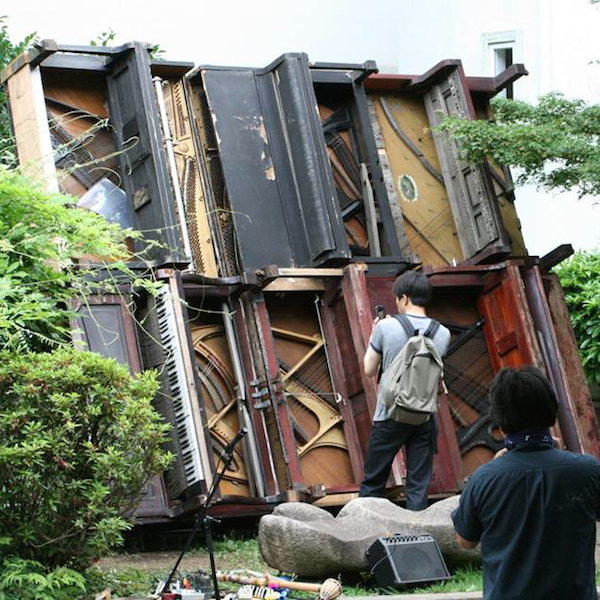 Through performance, Nao Nishihara will explore the abilities of ourselves to recognize space and human-beingness through the use of his kinetic sound machines. The presentation features traditional Japanese folk music and includes the rare videos of folk musicians, monks and street performers. Artist Statement: In my performance, I will show the notion of my body. One drum is on my back and the mallet is connected to my feet with a string from the drum. When I beat the drum by my foot through the string, I look like I am dancing and I can say that the drum is making me dance. In this point, I want to think where is my controlling system? Who is the boss of my body? Also, my kinetic sound machines are playing sound along with me. While they are on, I feel like I am in a band. The machines are machines, but they help me in the way that musicians do. Besides, they do not always work perfectly and need help from our body. I want to show the art of our own normal body, not because of the nostalgic reason but of the further development of the society and the technology. Presentation: I am going to show the RARE videos of Japanese traditional musicians created in the 1980s or earlier. I am influenced by those musicians and their music, both in their chosen way of life in their society and in their ability to create beautiful music. All of them are out-siders who consequently supported the society from outside of the law. And they are professional musicians who are totally independent of anything, the only way they to improve their lives is to improve their music. In this way, their music is beautiful. The videos are not on the internet because of the patent matters. So it is worth to come to Harvestworks! Also, I would like to show some pictures of my sound objects that I made. Nishihara is staying NY as the grantee of Asian Cultural Council and Omomuki Foundation, from December 2015 to June 2016. He performed at Experimental Intermedia on 15th December 2015. 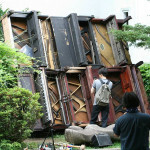 Focusing on the sound, Nishihara’s works have 2 aspects as the exhibition and the performance. In the other words, he does everything for sound. And he always focuses on the human body. Using sound, he tries to reveal the in-born abilities of the ears of us. Using objects, he tries to re-find our body, by provoking the movement of the body and showing the inevitable difficulty of the body. His works also include Kyogen (Japanese Traditional Farce), field recordings, study/ documentation of foghorns and instrument production. He translated the book Sound Art (by Alan Licht, Film Art Inc., 2010) along with Kazue Kobata and Hiroshi Egaitsu, and the book Music (by H.U. Obrist, Film Art Inc., 2015) along with Fumiko Uchiyama and others. He was born in Hiroshima in 1976. In 1998, he left Tokyo University of Foreign Studies (Czech Language) before graduating. In 2009, he graduated from Tokyo University of the Arts, with a degree in Musical Creativity and the Environment. In 2011, he obtained a master’s degree in Intermedia Art from Tokyo University of the Arts.